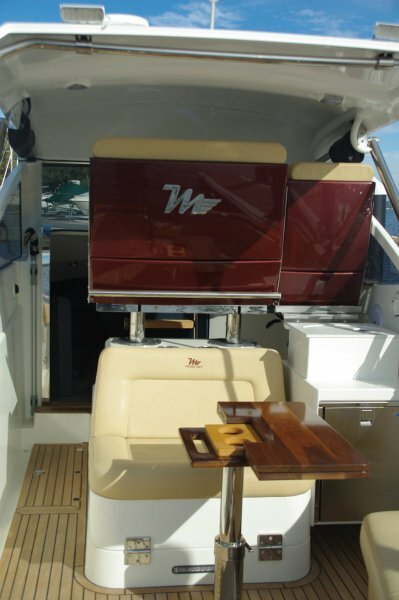 The builder describes the Magnus Craft Aeron 31 as a unique luxury waterjet sports cruiser, and I cannot dispute a single word. 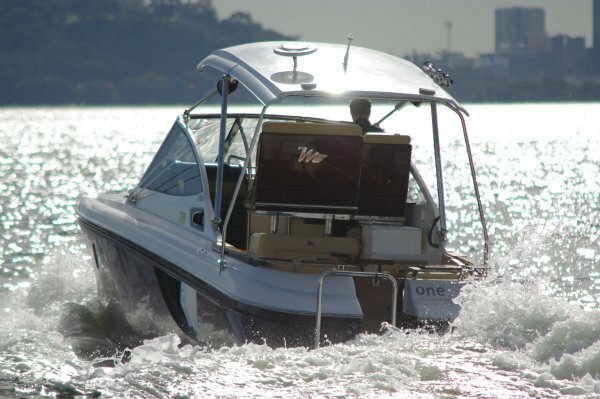 The boat is 9.5m over all, but only 2.48m beam so it can be towed anywhere at any time (or more likely kept on a hardstand and occasionally relocated); driven by serious diesel power and a Hamilton water jet; assisted in manoeuvring by a bow thruster; and chock full of thoughtful and, yes, luxurious features. 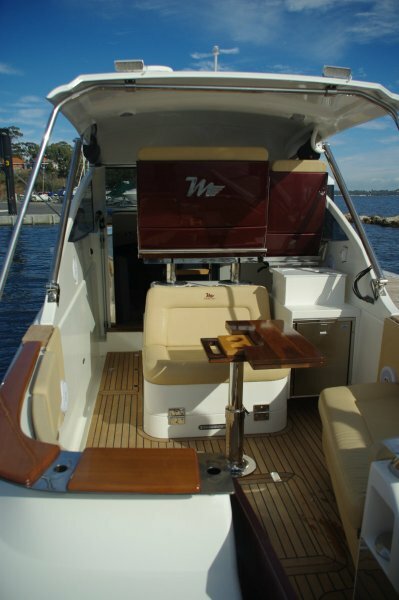 Very unusually for a new venture Magnus Craft are built in Western Australia – to an extremely high standard. The mould’s plug was carved by CNC cutter to an accuracy of better than a millimeter, and the hull is laid up using vacuum resin infusion. The whole is built to ABYC standards. 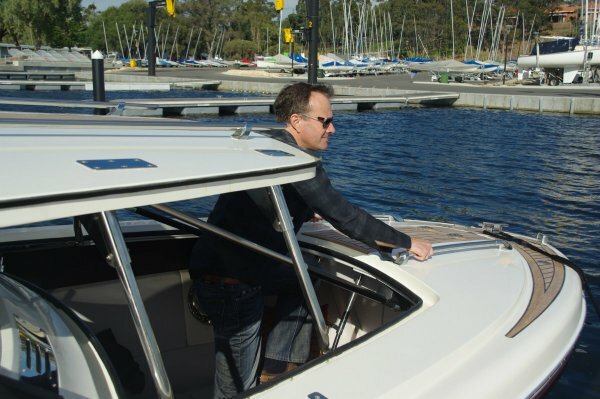 Trailing was one of the key aims of designer Mark Ellis, freeing an owner from the costs and inconveniences associated with keeping a boat in a pen. 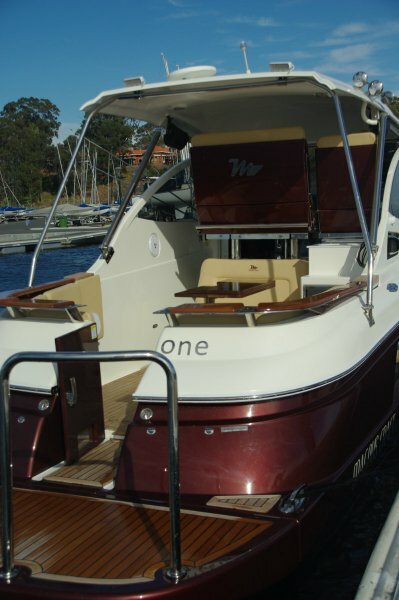 But the Magnus still has plenty of room for a family day at Rottnest and great comfort for a couple to spend a night or two aboard. 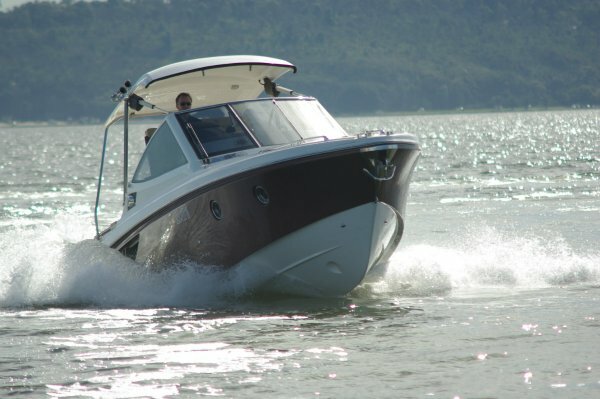 The style is intentionally reminiscent of classic vessels like the Chriscraft, even down to the review boat’s colour. The curves and the abundance of timber, and the massiveness of the beautiful Italian stainless hardware give a – realistic - impression of solidity and the love the builder and designer put into the Aeron. But, more importantly, they also created a boat that works. 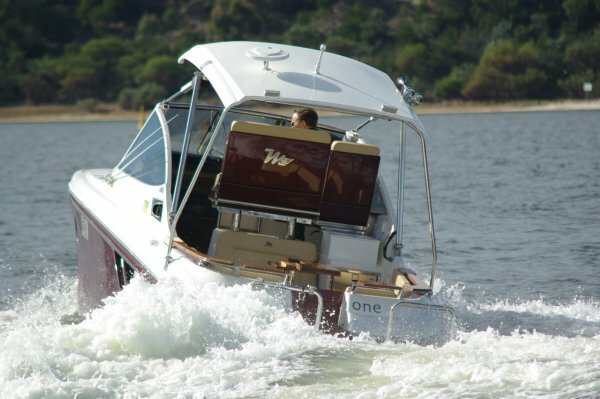 The big swim platform folds if towing length is a problem; the cockpit seats a swag of friends around a table, but seatsand table readily disappear if space is the requirement; much of the boat is double skinned with the cavity providing locker space; and infinitely more. The long timber sheathed foredeck is clear of impediments because the anchor works through a hawsepipe in the stem. Most of the deck itself power lifts to give air and headroom at anchor, and to give access to the bow ladder at the beach. 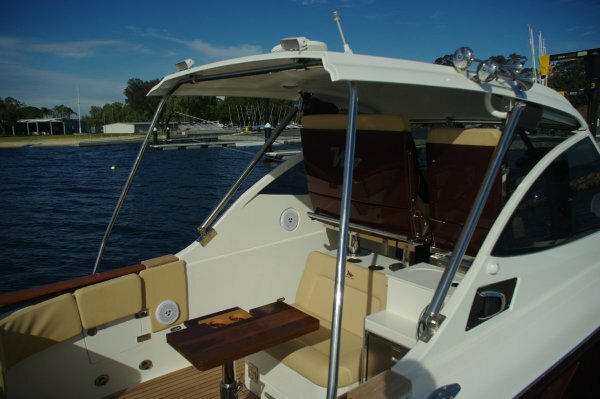 The hardtop over the driving position also lifts and moves aft to order, moving the shade to the sitting area. 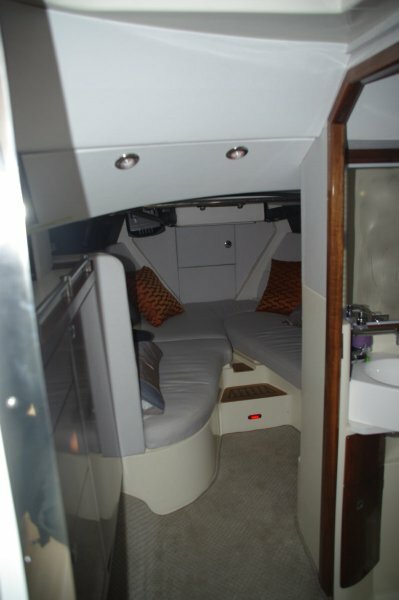 The fore cabin is large with settees that convert either to a 2+1 or a jumbo double; there is a lowering TV, and the LED lighting can dim or switch to party mode. The bathroom has full standing room, the height cunningly disguised within the driving position’s structure. The driver sits in a multi-adjustable chair alongside a double for friends; all are supremely comfortable and provided with well located footrests. The slightly unusual controls are for the waterjet: throttle, directional bucket and gear. 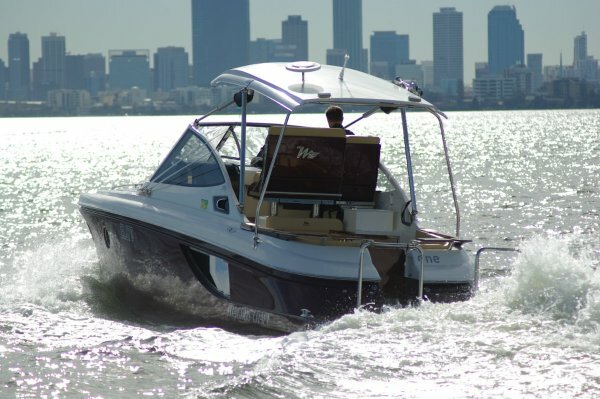 The gearbox, not commonly fitted in smaller vessels, is not for reversing the boat but for selecting neutral at the beach so sand is not sucked through the jet at idle, and for reversing flow to clear any weed; a valuable extra. Jet propulsion gives a loaded draught of only 0.45m, although sterndrive is optional. 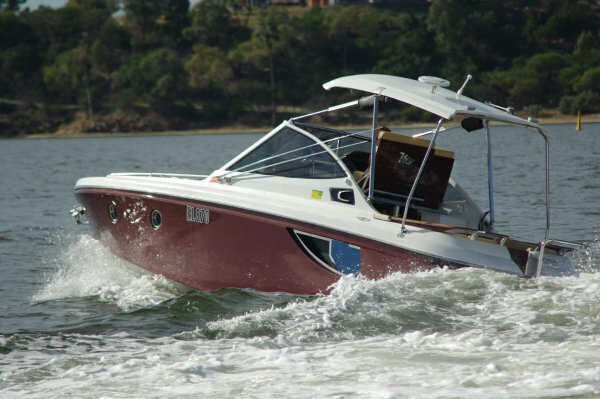 The standard motor is a 480hp Yanmar diesel. 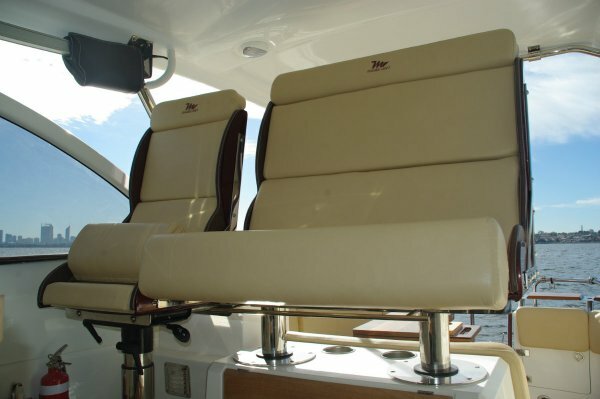 It is located amidships to get the centre of gravity in the right place and is connected to the jet by a jack shaft. Daily inspection access is by hatch and for maintenance a large section of cockpit lifts. Top speed is mid 40s, and at that speed the boat is remarkably dry. Perhaps those smooth curves give an air flow deterring spray. 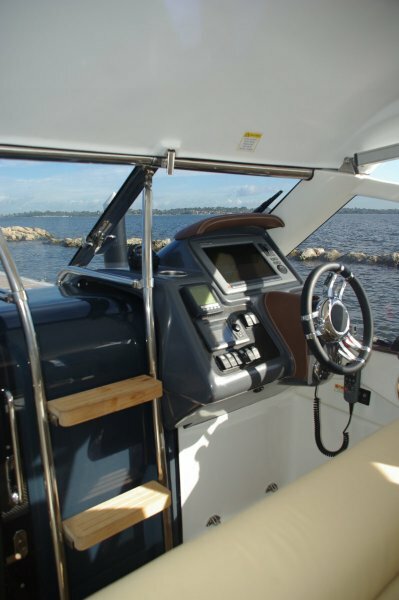 At anchor or beach comprehensive entertaining is on tap. A barbecue fits onto the platform’s rail, a fridge lives below the driver’s seat with a second in the transom, a single burner stove makes the tea and toast, and a superior sound system provides the ambience. It is highly unlikely that any two Aerons will be the same: a great deal of customising is on offer, there are other power options, and owners conscious of towing weight can delete items such as the power roof. What will be consistent is the sheer quality of fit-out: I have never seen more attention to detail in boat of this size.